The purpose of the following is to provide a baseline for further research. More than half a million private sector jobs (7.3 percent of State private sector employment) were affected by the attack on the World Trade Center (WTC). The area below 14th Street in Manhattan was the source of $47.0 billion in wages in 2000. This represents 14.9 percent of wages in New York State in 2000. While just one-third of these jobs were in the Finance, Insurance, and Real Estate (FIRE) sector, two-thirds of wages were in the FIRE sector. Large business establishments in the FIRE sector account for a high share of the activity in this section of Manhattan. A large share of New York State's economic activity occurs in New York City. In 2000, 44.3 percent of New York State's 6.9 million private sector jobs were in New York City (see Table 1). While the City contained less than half of the State's jobs, 58.7 percent of wages ($184.9 billion of the $314.9 billion) were earned in New York City. On average, jobs in the City pay more than in the rest of the State. Source: NYS Department of Labor. Just as New York City has a large share of New York State's employment and wages, Manhattan has a large share of New York City's employment and wages. In 2000, 62.9 percent of the City's 3.1 million private sector jobs were in Manhattan (see Table 2). Wages in Manhattan were $152.0 billion out of New York City's $184.9 total, or 82.2 percent. On average, Manhattan's jobs pay more than jobs in the rest of New York City. In the week following the attack on the World Trade Center, most economic activity below 14th Street in Manhattan came to a halt. All businesses were closed and no traffic was allowed below 14th Street. Continued disruptions to some portions of the area below 14th Street are expected for several more weeks. In the vicinity of the World Trade Center, pre-attack levels of economic activity will not resume in the near future. Table 3 shows employment and wages in Manhattan, below 14th street and in the vicinity of the World Trade Center. 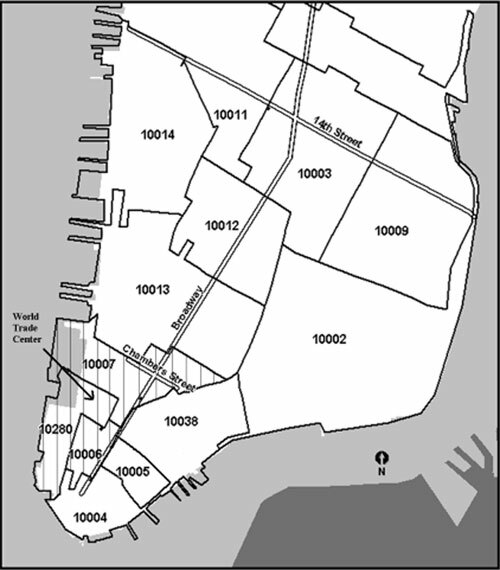 Twenty-six percent of Manhattan's 1.9 million jobs are in this area (501,000 jobs). Wages below 14th Street were $47.0 billion in 2000 and accounted for 30.9 percent of all Manhattan wages. In the vicinity of the World Trade Center there were 99,200 jobs. Although these jobs totaled only 5.2 percent of Manhattan's total, they earned 9.1 percent ($13.8 billion) of all Manhattan's wages. Table 4 shows the industry breakdown of employment and wages below 14th Street and in the World Trade Center vicinity. While the FIRE sector accounts for only about one-third of jobs below 14th Street, it accounts for two-thirds of wages. The securities industry, a sub-sector of the finance industry, accounts for 20 percent of employment and nearly 50 percent of wages. Although the service sector accounts for 38.3 percent of employment, it accounts for only 22.3 percent of wages below 14th Street. The concentration of FIRE sector employment was even greater in the vicinity of the World Trade Center. More than half of the employment around the WTC was in this sector in 2000. The FIRE sector accounted for 82.4 percent of wages. The securities industry alone accounted for 60.4 percent of wages, yet it employed only 34.1 percent of workers. Service sector employment accounted for 12.0 percent of wages and 26.0 percent of employment around the WTC. Table 5 shows the shares of private sector employment and wages by establishment size below 14th Street for selected industries. Overall, establishments with over 500 workers account for 55.9 percent of wages and employ 36.6 percent of the workforce in this area. The FIRE sector has a greater share of employment (59.9 percent) and wages (71.3 percent) in establishments over 500 persons. The securities industry sub-sector is concentrated in large establishments. Seventy-eight percent of wages and 72.5 percent of employment occurs in establishments with more than 500 employees. Note: The geographic area referred to as "World Trade Center and its Vicinity" can be roughly described as being south of Chambers Street and west of Broadway. The World Trade Center and its Vicinity includes the following zip codes: 10006, 10007, 10280, 10256, 10281, 10285, 10047, 10048, 10080, 10126, 10249, 10278, 10286, 10282, and 10279. The area below 14th Street also includes these additional zip codes: 10004, 10005,10041, 10274, 10275, 10043, 10045, 10081, 10260, 10265, 10268, 10269, 10270, 10271, 10038, 10272, 10273, 10292, 10013, 10002, 10012, 10009, 10003, 10011, 10055, 10113, 10114, 10177, 10213, 10276, 10277, and 10278. Single location zip codes are listed below under the zip code containing them. These locations are shown as points on the map above.